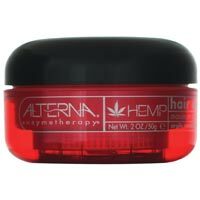 Alterna Hemp Concrete is infused with ultra-hydrating hemp seed oil, Alterna's Hemp Styling products protect and strengthen hair while addressing an array of styling needs. This product provides volume and definition with a flexible, ultra-hold and matte finish. Benefits: Soy proteins provide a rich emollient base. Creates an extreme hold with a matte finish. Directions For Use: First apply to the hands and emulsify, then apply to desired areas. Apply to dry hair and style. Buy a few Alterna products and package them nicely in a matching colored hemp tote bag and give as a gift all year long or buy it for yourself and indulge in a eco-friendly product!